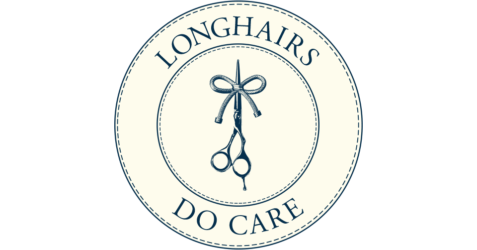 With our November check, The Longhairs have now donated $1,030 through our charity outreach, “Longhairs Do Care,” where we donate $1 from every sale to support folks who cannot grow hair. This milestone means we’ve exceeded 1,000 orders—which means if you’ve ever purchased anything from The Longhairs, part of this contribution has come from you. Hey guys that’s epic! I’m really happy to say that I’ve done this once and am currently working on my second 10 inches for them. And also that it’s awesome that y’all are partners with such a great organization like LoL. Keep up the good fight! Always shaved head, decided to grow it out to donate. I’m on 4 years growth! Want to grow it a bit longer so I’m not back to the awkward stage when 10-12 inches go. Stoked to see how far your dreams have come; let it ride! While some Longhairs may not mind having their hair fried, blown-out, extensions, permed, etc., know what you want, I for one do not want color or heat near my hair as I donate my lusciousness to an organization to help women and children who want wigs. It’s one thing to donate money, these guys have donated their hard-earned locks. Money can be earned overnight; long hair can only be earned with time. Way to go guys. We are damn proud to have you as part of this community. We are announcing the largest gathering of men with long hair in the history of mankind, or at least since Braveheart, for the purpose of cutting and donating our hair to charity. Together. Truthfully, I’m a little terrified putting a finite countdown on when I’ll part ways with my locks. I have nightmares when I wake up and my hair has been cut, much less doing it intentionally. After almost five years of growing, it’s not something that brings a warm and fuzzy feeling. On the other hand, there’s a certain confidence that comes with my commitment to keep growing for at least that long. I’m also comforted thinking, I don’t have to cut it all off. Shoot by that time I can probably give 12” and still be mid-areola. It also means The Longhairs will have to stick around at least that much longer, a heartwarming notion. Here’s what really matters: to a little girl who might not make it much longer, and whose hair and identity has been robbed by whatever affliction she’s facing, my hair will mean more to her than it does to me. When you think of it that way, it makes sense they would call it Locks of Love. Furthermore, this post gives every man and boy a perfect and legitimate reason to grow his hair out. Any spouse, parent or employer who has something to say about your long hair, all you have to do is point to this post and tell them, we’re growing it out for a purpose: for donating our hair to charity. As most people’s hair grows a half-inch per month, 24 months from now means 12” of growth between now and then. And since Locks of Love has a minimum donation length of 10”, most guys can start right now and be ready come game time. Not only do we accept the challenge, but we charge you with the task of spreading the word and recruiting our fellow brethren to the cause. Every man in the world can accept this challenge, today, with purpose and conviction. Which brings us to the final question: will you join us for The Great Cut? This is AWESOME. You guys are AWESOME. I LOVE this idea. AMAZING. Soy de Puerto Rico como puedo hacer llegar mi cabello a lla pues no tengo economicamente como viajar.Puede alguien ayudarme. Yo Freddy! Gracias por tu comentario, amigo. ¡Intentaremos ayudar, ve con todo! a little European npo does collect hair, but you don’t cut to donate; you donate when you want change your head and cut your hair, and we suspect that hairdressers propose collecting locks to cut short and get a new regular customer…. Appreciate your thoughtful comments as always chamane! We can all agree on the charitable cause, and we’ll always consider your thoughts. This is rad. I’ve donated to LoL once but my sides were shaved so it wasn’t quite as much hair as I would have liked to give (it was all 10″ though and qualified for donation). Now that I’ve been growing it out all over and am just past my shoulders, I’d have even more to donate. If I don’t participate in the 2018 edition of this, I’ll definitely participate in the 2019 or 2020 edition. Rock on! Yes man! All these comments are making us think we might need to bump it back to 2019. We’ll see what happens, badass you’ve already donated! Yeah, 2019 or even after would be far easier for me to commit to. I have gone back and forth on cutting my locks several times. I thought I was going to give it away a few years ago. I chose to wait after I spent time in Chile and Argentina with other Longhairs while spreading the Longhair news to the mundane. Then I thought I was going to give it the ol’ 1, 2, chop when I was completing global service in Laos, Cambodia and Vietnam and chose to wait again. Last year, I sent time working with indigenous communities in Australia, New Zealand, Singapore, Malaysia, Borneo and Bangladesh and came close to losing my length as part of a cleansing ritual but did not move forward. My hair has begun to define me — courageous, bold, adventuresome. This winter I am off to Africa and Iceland. When confronted about my hair, I will explain to my new found friends that I am waiting for November 11, 2018 as part of a movement with other like-minded souls from around the Earth. I will then be defined by my hair as gift giving. So, here is to two more years of fabulous. By then, my hair should be past my belly button and long time overdue for a 12″ trim. Equus talk about hangin in there!! Was hoping you would comment on this, and really well said man. The travel is just spectacular, how your hair is part of your identity, and especially that you’re IN for the cut! What better excuse to grow it out for another two years?? That’s how I’m feeling anyway, and that I’ll be able to cut 12″ and still be past my shoulders (hopefully). Here’s to it amigo, thanks for writing in as always! Man. I really wish I had not forgotten about this before I cut 12 inches a few weeks ago on 10-21-2016. At the moment I am deeply scared to endure another awkward phase. Since I happen to still have my 12 inch men’s tail, mind if I use that as my big cut donation on 11-11-2018? Or maybe I should just wait for the big cut that follows next after this 2018 one. If my hair is long enough to donate without reverting to an awkward stage by 11-11-2018 then I will commit to this big cut shortly before its happening and drive myself to San Diego to join in on this historic moment. Cesar, hell yeah man! No worries you already cut it, send it in! You can start growing again and if you’re in by 11/11 then great, if not we’ll do it again. Either way make it down here for the event, it will be like charging the English lines. Thanks for writing in and for supporting the cause mang! Well I have never been to San Diego, and I cannot think of a better reason to visit than for the big cut. I don’t think there has ever been a moment like this in documented history, I just gotta be there! Unless I experience some kind of emergency, you guys can count on me to show up. I am saving the date on all my calendars! Yes man! We will be pumped to have you here! And hey, if your hair isn’t long enough you can still join and save the cut for the next year. We’ll see how it goes! Can’t promise that I’ll be able to make it to the actual event, but I will make sure a good portion of my hair is donated to the cause. Yes man! Don’t worry. We understand lots of guys won’t be able to come to San Diego. We’re thinking of having regional locations or at least some kind of meetups. We’ll see how it goes but whatever happens you’ll be involved! Way to make the pledge hombre! This is indeed a great cause. I’ve been growing for 9 months as of now. Coincidentally I was planning to donate on the exact same day, which happens to be my 20th birthday. Talk about a great birthday gift, a gift to someone who needs it more than I do. I’ll definitely spread the word. Longhairs Do Care. Dude, coincidence of the decade??! You are meant to be there. Hope you can make it man, in any case stay tuned! I can truly say that The LongHairs have heart.They have been selflessly giving to charity.All of these large corporations who make so much money and then use that money to make more money that enriches themselves financially.But the LongHairs,they enrich their souls.I am so grateful that I am participating in this event and I encourage everyone to take part in the Great Cut! This is an awesome idea!! I’ve never made it to the west coast yet, but I see that coming off my bucket list! My hair is about 11″ now, but doesn’t seem as long since it’s so curly. I’ve been having people look at me longer than usual when out and about, as this is the first time ever growing it out. I still have not tried tieing it back yet…don’t know what will look good on me yet. Yo Marty! Thanks for the comment man, hope you can make it for The Great Cut. Try tying it up, you might like what you find. I think I want to donate it, but if I cut it I still want to have shoulder length hair still left. I am up to this challenge ! God Bless You LongHairs ! I was planning my every other year donation to Locks of Love this September 2017. Instead, the wife and I are now planning a vacation to San Diego to join in the festivities. Hope to convince daughters to join and donate as well. All for the cause! Please keep us informed so we can coordinate and finalize plans! My length is approaching belt line now. Going to be interesting to see how long it gets by then. Will definitely be the the longest it has been in a VERY longtime. That braiding tutorial from El Rubio is frick’n handy to keep the length and volume alive! Looking forward to meeting you fellow Longhairs!!! Yo Jay! Thanks for writing in man that’s awesome! We will absolutely love to have you come for the event. Just a head’s up—we are looking to change the date range to Q1 2019. There are a ton of angles to this and we want to make sure we do it right. All details will be posted here so stay tuned. And give your wife a high five from The Longhairs! You know, for being down for the flow. Thanks again amigo, keep lettin it ride! Stay in the win column. One week at a time.